This is a job that I was putting of for a long time and wasn’t looking forward to it. It’s a know fact that the Mustang doors are heavy and the hinges take a lot of punishment, especially when they are left open as the weight pulls on the hinges. They need regular lubrication. The removing and refitting the doors, it’s a two-man job. I was a little scared about what I would find when the doors came off so I just decided tot bite the bullet and get on with it. I spoke to Adam at Mustang Maniac who got me the parts; Four steel pins and eight brass inserts. If this didn’t work it would be a hinge replacement kit. I am lucky that the hinges still have the door catches in place that stop the doors from flinging open. These sometimes break off and need replacing, again the hinges need to come of for that job too. how can you tell if you need to replace the hinges? The doors sag when you open them and the door can me moved horizontally up and down. A tiny fraction at the hinges will be amplified by the time it gets to the door striker plate, the door will be then lifted up onto the plate instead of closing to it. OK, there are two hinges each side. Top and bottom with a door catch on the bottom hinge. Each of the hinges to the car are held in place with three bolts, the top hinge to the door has two bolts and the bottom hinge to the door(s) again has three bolts. I soaked all the bolts with the Gibbs Brand Lubricant to allow it soak into the threads. I had the anti-rust treatment ready, all the tools to hand, trolley jack and gardening gloves! The photo’s are a mixture from both sides but the principles are exactly the same. I found this out when doing the second door. Its much easier to adjust and refit the hinges with the fender removed. I did it with the driver’s side on, but it was awkward. As my fenders were only held on by a couple of bolts each side I took them off to make it easier. If you can take them off, do it, if not make sure you have wobble bars, long sockets and a variety of spanners that best fits your needs. The first thing is to mark up the position of the hinges, with a marker pen or similar. When you come to put them back on again you will have a rough idea where they came from that will give you a fighting chance to line the door up again. The second thing is to crack all the bolts loose on the door side of the hinges by half a turn, there is nothing worse than getting to the last bolts and unable to get it out while holding a heavy door. Once you have established that the bolts will move I gave another squirt to make sure they come all the way out. I removed the bottom two bolts that were most difficult to get to on the bottom hinge. I removed the top bolt on the top hinge that left bolts. I now jacked the trolley up to the door underside in the middle with a non-slip mat in place, an old rubber shower mat is good for this! I then undone the bottom bolt which was not free. Holding the door with the spare hand, with the glove on as some of the metal bits are sharp when the inside cover is removed. This would stop movement while I undone the top bolt. The door will move a lot and settle this is where you need a second pair of hands. I unfortunately didn’t when removing the doors but it can be done on your own. They are heavy! Once the bolt was free I lifted the door to the sheet and old bath towel I laid on the floor. Once the door is off the removal of the hinges is three bolts top and bottom. It doesn’t matter which one you take off, but I will say the hinges are heavy and make sure you have hold of them or you will cause some serious damage to the bodywork if you drop them on it. Once the hinges are removed there is a steel plate behind the body work that holds the hinge in place. You will have to remove the kick panels to get to it though. Remove the plate and treat if required with anti-rust. While I was in there I treated the inside of the post as well for rust just to make sure. I wasn’t surprised with what I found, but it looked worse than it was. The plates will only fit in one way if you remove them. Tip: Watch your fingers as the plates are just cut from a slab of steel and has sharp edges. Trust me! I treated the underside of the door and the exposed areas that you normally don’t get too. The next part is the fun bit. These pins have been in the doors for forty-seven odd years and they were not coming out easily. If you don’t want the hassle of getting them out get a replacement kit. But its worth trying to keep the original hinges. Getting the pins out is nightmare, you need a solid vice to hold this tight in place. I can tell you how I got mine out, one of them was a real pain, the bottom of the pin was cut at an angle and made it difficult to remove, hitting with the punch made it slip off the pin. At one point I had to use a blow lamp to heat it all up and then start knocking the pin out. my 10mm punch was still having issue. I found that the splines at the top are the problem as the are squashed into the top of the hinge bracket. I had an old screwdriver with a heavy handle that I filed to a fine wedge and forced it under the head. Once I moved the micron of an inch I could drive the wedge shape into the pin space to lift it up a little. Once the seal had been broken as it were you were ninety per cent of the way there. I used a five-pound club hammer to get the required force to move them pins and the ten millimetre munch. Top hinge set of pics. Once the pins are out knock the brass cups out of the hinge and clean inside the bore. Insert the new brass cups into the hinge and then apply plenty of grease inside. Knock the pin back into the hole using a solid base to rest on, If the pin is slightly longer allow for the difference to let the bolt seat fully home. Here are some pictures of the right hand side with the door and fender off before the hinges were removed. Once everything is treated and ready for assembly put the back plates back into the door piller. Make sure the bolt threads are cleaned up and lubricated. Offer up the hinges and tighten finger tight. Insert the other bolts into the plate and again finger tight and nip up a single bolt once the hinges have been aligned to the previous marked up location. The door hanging; This is the fun part and you will need two people. Again rest the door on a rough height and get the other person to move the door to the hinges, insert a bolt into the top hinge, finger tighten up and located a single bolt into the bottom hinge as well. The other bolts will need to be moved around and located to fit the plate in the door. Once you have lined up the bolts to the hinges on the door nip up and take a breather with the support still on the door. Once you are ready remove the support and gently shut the door the catch. It wont line up unless you are real lucky. Now the fun begins to move the bolt and plates around the door and the post to get it lined up correctly. There is a massive amount of movement for the door around two inches up and down and about one inch on the twist. The gaps should again line up with the rear quarter panel. Adjusting the front fender to the door. You shouldn’t have to touch the hood. The pins I removed were damaged and worn. You can see the wear bands on the pins and the corrosion. The brass cups were cracked and one broke trying to get it out. The new pins should outlast me now and I shouldn’t have to do this job again with any luck. bottom of pins, the angle one would have to be the worst pin! 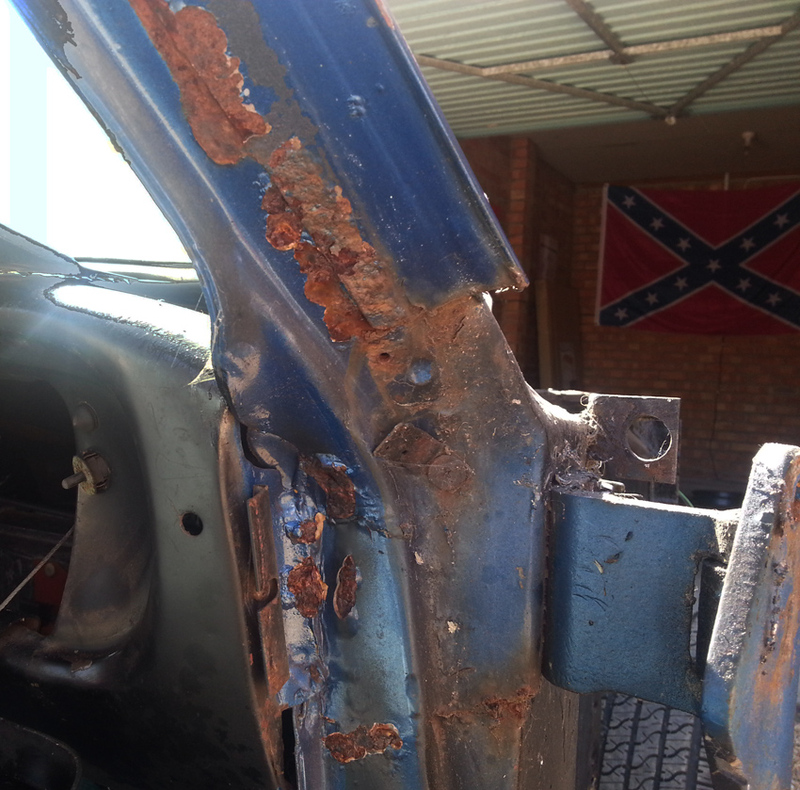 While the door was off I checked for rust under the bubbles, I found some on the passenger side. I treated and filled with POR15 seam filler and will wait for that to cure before I make it good. I will update again when I get round to doing that part. The rust looks worse than it was. The doors took a while to line up again and much patience is required. Having to undo the bolts move a fraction and re tighten again. Using a wooden wedge to get the gaps while tightening is also a good idea. The doors do not move and that pre-clunk before the door shuts has now gone. The doors open a lot smoother and quieter as well. A two-man job without a doubt. You will need high quality punches 10mm for the main pin and smaller for removing the cups, a sturdy vice with good jaws, a heavy hammer, possibly a blow lamp and some grease. The rust treatment is good idea while you are at it. I used the Granville Rust Cure and Gibbs Brand to help look after the hinges. Would I do it again? If I had too, but I don’t want too. Separating the hinges was the most difficult to be fair. Would I recommend it? Yes to get the doors sorted out, but the fact the fenders are the key to accessing the bolts with the door on for lining up could be a major factor. If you are at the stage I am, then do it. If you have a nice paint job – leave it for the experts. I’m installing a new hinge kit and found the pins came out with a little persuasion. Since you could see the bottom of the pins, I used a punch to drive them out. However, I also want to replace the longer pin/post with the roller collar on it. You cannot see the bottom of this one. Hi Dennis, thanks for stopping by. I didn’t need to replace the pin with roller collar on it so I never removed it. I was of the opinion that if the hinges were that worn I was goin to replace them. A tiny movement at the hinge side makes for a fair amount of movement at the latch end. I have taken my passenger door off , and bolted the new bottom hinge in place. NOW how do I get the door hung and aligned. Do I have to remove the fender? Hi, you dont need to take the fender off but it certainly make life easier for sure. Otherwise you have adjust, shut the door, open adjust and keep repeating. If the fender is off you get to all the bolts at once. As they are long doors a tiny adjustment goes a long way.